When we talk about wanting to share our travels with those who are not able to travel, at first that mostly meant my mother. She always wanted to travel, but because she started a family early there was no time. Later she was a foster parent and adopted three small children in her later years. There was really no time or money for travel other than occasional visits to see family. She told me once that she loved following our travels, with the photos and video she felt like she was there with us. With us living in Texas and her in Oklahoma, we didn’t see each other as often as we would have liked, but our travel blogging was a way to let her keep up with what we were doing. Ren and I talked about our travels with my parents one evening and they both encouraged us to pursue what made us happy, and not to put it off. Last year we lost my mother in a car wreck. In September we took her ashes to Piggott, Arkansas, to be buried next to my Father’s family, where he will one day rest. I had not been back to Piggott since we moved away when I was twelve. Since she loved our travels so much, we decided that we would do something special on this trip. The burial was to be on Saturday, so we left a few days early, and set out to visit seven new state parks in seven different states. She would have been amused by us cramming in as much as we could. We set out on Thursday morning and our first stop was a few hours up the road on Grand Lake. Twin Bridges State Park in northeastern Oklahoma. This is a very pretty area and was extremely peaceful when we were there in the middle of the week. Here we were able to see an old stone barn being used by the park to store their landscaping equipment. We had seen this type of structure in the area, but often those buildings are no longer in use. The highway 137 drives through the middle of the park separating two campgrounds leading down the hill to the boat ramp area. It was here we were able to see a squadron of pelicans on the Grand Lake on their yearly trek south. 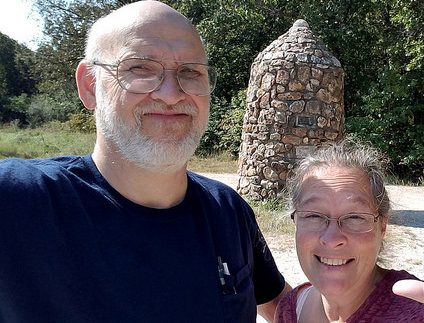 After a brief detour to the OK – KS – MO Tri-State marker, we headed up into Kansas to visit Crowley Fishing Lake. Now we have been to a lot of parks on a lot of lakes, probably hundreds by now, and we always try to find something that makes each special. This particular park was built by the Civilian Conservation Corps back during the depression, as a way to put young men to work. That in itself is not unusual, so many state park systems got their start from the CCC, and we always enjoy seeing the CCC construction. It has a very distinctive style that we really like. This particular park had a monument to the CCC and an outdoor museum. That was it for parks for the first day. Now we had to put some miles behind us as we headed across southern Missouri to our hotel in Sikeston in the SE corner of the state. We were driving through the northern Ozarks, and it was our first trip into Missouri. 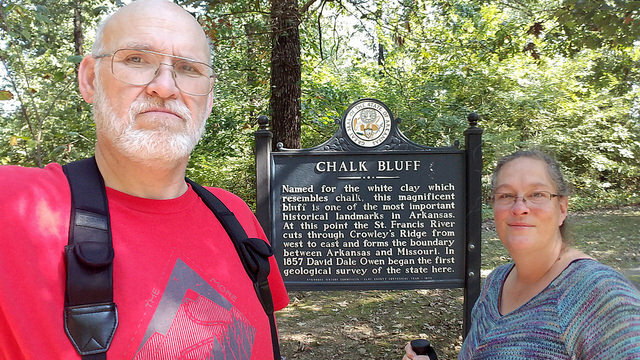 We found it just a beautiful as NW Arkansas and were making our plans to return. We would have six counties left to someday collect, but this was not one; however, by the time we reached the hotel, we had collected 15 counties in Missouri. The next day we would get more, but now it was time for sleep. 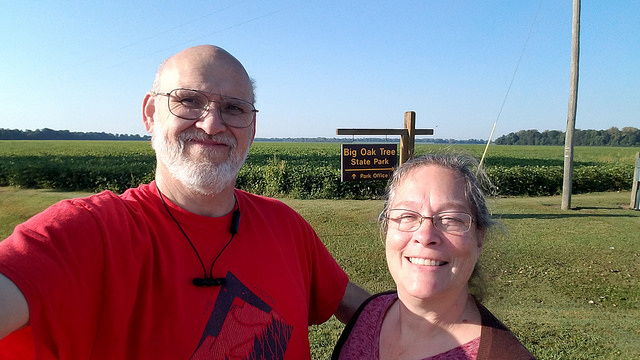 Friday morning we got up and headed the short drive down into the Missouri bootheel to Big Oak Tree State Park. Most of the old growth forest in this area was logged long ago, but they preserved this small patch. It contains some of the largest trees of various species in the state. The area is a bit swampy, but they built an elevated, metal walkway through the forest. The trees were awe-inspiring, though the forest was dense enough that it blocked any breeze, so it was muggy and buggy, but worth it. On the way out Ren tripped and hurt her ankle. She insisted we complete the trip, but it did limit our activities for the rest of the journey. 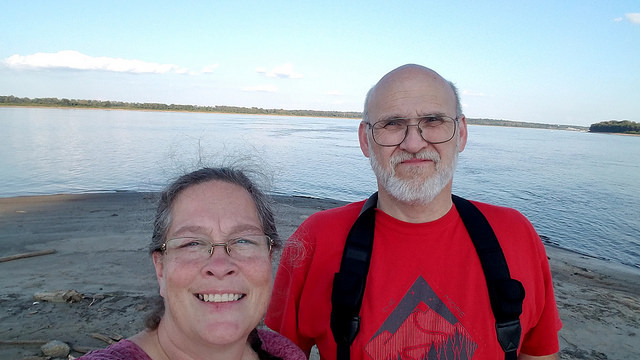 After we left Big Oak Tree we headed up the west side of the river to Cape Girardeau where we crossed the Mississippi River into Illinois, where we gave into our inner bunny and briefly entered bunny-trail mode. We found a historical marker that led us to Thebes the original County seat of Alexander County. Abraham Lincoln once practiced law here and Dred Scott was held in the jail while awaiting trial. We then headed up through Jonesboro where we stopped at a park where one of the Lincoln – Douglas debates was held. Exiting bunny-trail mode, we headed up to the town of Makanda and Giant City State Park. We immediately fell in love with this park. The trees, the creek running through the gorges, the beautiful drives. We were not able to take any of the hikes to see the parks best features, due to Ren’s ankle. But what we saw of the park we loved; we seem to be suckers for big rocks and massive elevation changes. After a quick picnic, we got back on the road. Due to our detours, we were behind schedule. We headed south to the town of Cairo, the current county seat of Alexander County. Located at the southern tip of Illinois, on a narrow peninsula between the Mississippi and Ohio Rivers. This is where we were to cross the river into Kentucky. Cairo itself is not much of a tourist destination. Just south of town is Fort Defiance State Park, once it was a state park and before that, it was a fort during the Civil War. This is at the point where the Ohio River joins the Mississippi River and it was there we took a photo of us standing “in the confluence.” It was pretty, but we did not linger; this whole area did not feel like a place you wanted to be after dark. We headed across the river and drove down the eastern side of the Mississippi headed toward Columbus Belmont State Park in Kentucky. This is the site of another Civil War battle and runs along the Mississippi River where the Confederates placed a large chain across to keep the Union at bat. By this time it was getting dark, and Ren was in extreme pain causing her to not leave the truck; this is definitely not like her, so it must have been really bad. We drove through the park, and I got out to take a few pictures from the bluff overlooking the river. We continued South along the river and passed into Tennessee. By now it was fully dark and we had one more stop to make before heading to our hotel room in Piggott. Reelfoot State Park. We certainly did not do this park justice. It was dark and we were exhausted, but we did do a quick drive through to see what could be seen from the road. Grabbing the first state park sign we could, we took what we could; however, within a mile, we were able to find the actual state park sign. Unfortunately, Ren’s ankle was causing her too much pain to do anymore and we just took a photo of the sign without us in it. Finished, we headed south to the nearest bridge across the river, crossing back into the Missouri bootheel before crossing the St Francis River and finally entering Arkansas. Piggott is tucked right up into the bootheel and we were quickly at our hotel. After visiting with the family awhile and getting Ren’s ankle up and iced, we headed to bed. Our total for the day, four parks, and Ren was sure Mom was cheering for us all the way. Saturday was spent with family as we buried my Mother’s ashes, and spent time getting acquainted with family we hadn’t seen in many years. Ren and I made time to tour the places where I spent my childhood such as the elementary school I attended was closed and abandoned. The giant hill I used to race down on my bicycle, looked so tiny and hardly terrifying at all. We also took a few hours and visited Later a few of us drove over to Paragould where my Mother’s parents are buried. Sunday we got up and hit the road as early as we could; everyone needed to get home. We headed back to Tulsa on highway 412, crossing Northern Arkansas. It is definitely not the fastest way home, but we’ve always thought the journey was something to savor; we seldom take the interstate unless we are trying to get to a specific place in a short amount of time. 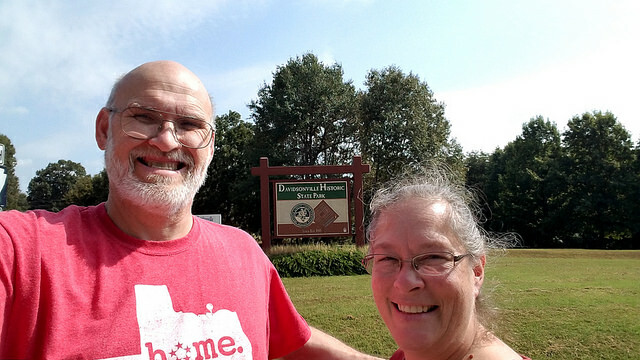 We dropped south to visit Davidsonville Historic State Park, our seventh and final state park in our seventh state. Located on the Black River, this park has a lot of history to explore. It was originally the country seat for this entire area of the state before being broken up into several other counties. We are suckers for the historical parks and spent more time here than we planned. Leaving the park we continued west into the town of Hardy. My grandfather had been the pastor of the Methodist church there when I was very young, but I remember visiting them at this river town. Ren and I took a few minutes to see if we could find the old parsonage; I’m still not sure if we did or not. We spoke with someone who worked there, but she had no information she could share. Deciding it was time for lunch we found a very nice little park next to the Spring River, where we stopped for lunch. Ren tries very hard to make sure we always have plenty of food that we will eat when we travel. It has helped us to keep our expenses down. She had not let us down at this point either. We continued west across Northern Arkansas, and I can’t say when I’ve enjoyed a drive more. This is some of the most beautiful country anywhere, and we’ve fallen in love with Arkansas. Ren thinks it is because it is our “home” and wants to live in the Arkansas Mountains, but when does she not what to live where we visit? Eventually, we made it home, much later than we had planned, but we always do. It probably sounds strange to say that I really enjoyed the trip to bury my mother; it sounds strange to me too, but the burial was several weeks after the funeral, and my memories of that weekend are an odd jumble. The burial, visiting both of my grandparents’ graves, spending time with family, revisiting where I grew up, and all the wonderful places we visited, all just kind of blend together. Travel is how I cope with the stresses of life. It’s how I heal and how I nourish my spirit, and I am so lucky that I have a wonderful and amazing person to share all that. I returned from that trip feeling at peace and I know Mom would have appreciated and approved of it; she would have asked to see the pictures for sure.